There is an old saying that says "the best time to plant an orchard was twenty years ago, the second best time is now". But how long does it take for fruit trees to bear fruit when grown from a seed? Not just how long do books say (often written by people with no personal experience who have just done some brief internet research), but how long does it really take? I have seen people ask on forums about growing various fruit trees from seed. Generally, helpful people pipe up and say not to bother as it takes far too long or it is too difficult, or the results are bad tasting. Not surprisingly very few of these people have ever attempted to grow a fruit tree from a seed and are going off what they have read somewhere that was written by someone who also has no experience. I have grown various fruit trees from seeds, most didn't take overly long to bear fruit, most were very simple, most tasted great. I have grown a bunch of fruit trees from seeds over the years, it is far easier than you think. The results are mostly not the same as the parent plant, sometimes this is a good thing, sometimes it is bad, and sometimes they are near enough not to matter. Many fruit trees for sale are unnamed or the name tags have been mixed up, so creating your own variety from growing from seed is not necessarily a bad thing. If you plant seed from improved stock the chances are high that any resultant fruit will be decent. So how long does it really take for fruit trees to bear fruit from seed? From my experience I can say that it is not as long as you probably think and certainly nowhere near as long as everyone says. I did a google search and found a company overseas who gives indicative time frames for fruit trees to bear fruit. They are not counting from planting a seed, but are counting from planting a one to two year old tree which has been grown from a cutting or grafted. I have cut and paste the following table from their website and removed their company name. This company's trees are 1-2 years old when shipped. “Years to Fruit” begins counting after the trees are transplanted into your growing space. These crazy time frames make no sense if they are from planting a two year old tree, they are far too long. Please ignore the times listed in the above list. Let me give you some examples of how long it takes to grow a fruit tree from a seed from my personal experience. My son planted an apricot seed, it has flowered and had some fruit (until it was taken by birds) when it was only in its third year. If I bought a dormant apricot tree and it did not flower and fruit that same year I would be disappointed! Three years from planting the seed to seeing the first fruit for an apricot is not unusual, it can be faster, and it can certainly be a lot sower if not looked after, but three years is pretty average for apricots to fruit from seed. I have grown both peach and nectarine from seed many times. As far as I am concerned peach and nectarine are different varieties of the same tree. Some of the nectarines were white fleshed, others were yellow fleshed, they were all seeds from un-named seed grown trees and I had no way of knowing where the pollen came from. For me most flowered and fruited in their third year, some never flowered and some even flowered in their second year! Due to the good genetics of peach and nectarines in Australia, all of the seed grown fruit tastes good. From talking to a few other people who have grown them from seed I think three years from seed to fruiting is the average. I have grown many many cherry trees from seed, they all flowered in their second or third year. Unfortunately the fruit was all dreadful. Small, sour, lacking any depth of flavour. The trees never got overly large and were besotted with cherry slug. I have a feeling the poor quality fruit was not genetic but rather was caused from growing conditions as they had no additional water and not enough sunlight. Had I bought a named variety the fruit would likely have been just as bad as my conditions were not ideal. I have grown many plums from seed, they varied somewhat but generally flowered in year three. The results were diverse in terms of size and colour of fruit and thorniness of the plants, but the parent stock was all diverse to begin with. None of them were ever bad to eat. 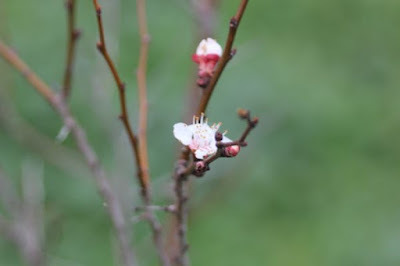 I have also had plums and cherries growing too close that have naturally grafted to one another with no human intervention, but that is a topic for another blog post. At work I once found a tiny seedling in the garden with cotyledon leaves. I took a liking to it and put a cage over it to protect it. It grew into a citrus tree presumably from a seed that someone had dropped. It was rather thorny and only took 3 years to flower, I have no idea if this is a representative time frame or if this volunteer seedling was just exceptional. I have had people tell me that they had fruit in the first year and others who claim ten years is normal. Unfortunately I left the job and moved before I got to see the fruit ripen. I assume it was either an orange or a lemon. I am told that key limes (Citrus × aurantiifolia) generally only take 2 years from seed and are always very similar to the parent plant. I have never tried to grow a fig from seeds. I am told by fig collectors that it usually only takes 2 or 3 years for a fig to fruit from seed. They also tell me that fig seeds produce 50% inedible caprifigs and 50% edible figs. Figs from seeds are complex, I don't have enough room here to experiment with them. If you like figs then I say give it a try, they appear to yield very fast when grown from seed! Just to discount the above table even more, at one of my previous houses I planted a nice mulberry tree. I wanted to bring it with me when I moved so took a small 10cm cutting. We moved in January (mid summer here in Australia) with this tiny rooted cutting. The following January the tiny cutting had grown to about 5 feet tall and had some fruit. Unfortunately I have not grow mulberries from seed yet. I have heard that 10+ years is normal but have a feeling I could get it down to about 3 or 4. I have also heard all kinds of stories about it being difficult and doing odd things such as changing gender several times. If you have any mulberry seed and are willing to send it to me I would love to try and grow it! If I grow a seed from a certain variety of fruit tree will it grow into the same variety of tree? No. Many, if not all fruit trees exist in the heterozygous state and most fruit trees are complex hybrids (bred by crossing hybrids with hybrids of hybrids) which carry genes from several related species. This is often more evident in older heritage varieties as they have been grown from seed for less generations. While it sometimes may be possible for a seed grown tree to be similar to its parent it is unlikely. If I grow a seed and the fruit tree self pollinated will it grow into the same variety. No, of course not. As mentioned above many fruit trees carry a wide range of genes, some dominant that you will see, some you can not see as they are recessive, some co-dominant so their expression will only be noticed if you have both genes, etc. Self pollinating a heterozygous plant simply means that some of these genes that the parent had will be lost in the seed grown tree. Losing some genes never results in the plant being the same as its parent so while it is possible that the tree may be similar to the parent it will most likely not be the same. If I grow a seed from an old heritage variety of fruit tree will it grow into that same variety? No, this seems to be one of those illogical myths spread by people who have no experience in growing from seed, no understanding of basic genetics, and a weak grasp of general horticulture. Being an older variety makes it far less likely for the seed grown plant to resemble its parents. Older varieties of fruit tree have been grown from seed less times than the newer varieties, as such they often contain a far more diverse gene pool and are often considered to be unimproved stock. In colonial America they used to say that one in ten apple seeds would grow for fresh eating, the other nine would grow into "spitters" which were great for cider. Modern varieties have been bred to reduce undesirable genetic traits, as such they tend to have a lower percentage of seeds grow into undesirable plants and a higher chance of getting something nice. If I grow a fruit tree from a seed will it be better or worse than the parent? It could be superior, it could be similar, or it could be far worse and utterly unpleasant to eat. Professional fruit breeders and research facilities grow out many thousands of seeds before they find one that they think is right, however, their breeding goals are vastly different from yours. They want a long shelf life, bruise resistant hard fruit, short harvest period, high resistance to spray drift, relatively low productivity (to reduce the need for thinning), uniform fruit size/shape/colour, good response to long term cold storage and subsequent ethylene ripening, and so on. You want great tasting fruit, long harvest period, soft fruit, and so forth. Your goals are pretty much the opposite goals of commercial breeders. Don’t professional breeders know a great deal more about plant breeding than I do? Probably, but it doesn’t help much in this situation. In the end they are usually crossing improved varieties and hoping for the best, just like you. They may have the resources to grow out many thousands of plants, which is a huge bonus, but as I said previously they are hoping to achieve something very different than you want to grow. As I said earlier, professional breeders have very different goals to home growers. It is too bad one of those permaculture research places does not invest in breeding fruit tree varieties designed for the needs and wants of the backyard home grower (hint hint). Isn’t it difficult to grow fruit trees from seed and will I need special equipment? No, growing many varieties of fruit tree from seed is simple and requires little equipment. Some types are difficult (I have no experience with anything tropical) but most temperate fruit trees are simple to grow from seed. The main things you will need are space, soil, time and water. If you have a pot of soil and have time to water it then you are well on your way. Some seeds may need cold stratification, but this is simple to do if you have a fridge or live where it gets frosty. Should I bother growing a fruit tree from a seed? I don’t know, it depends on your circumstances. To be honest it doesn’t affect me greatly either way. I sell neither fruit trees nor their seeds so I have nothing to gain or lose unless you happen to grow something amazing and share it with the world. I honestly think if you have space, then growing one fruit tree from a seed in your life is a great thing to do. Can I reduce the time frame from planting until it bears fruit? Sure, treat the tree well and it will flower in the minimum of time that it genetically can. You can also graft a seedling scion onto a branch of a mature tree and then forget about it until it bears fruit. If doing so the seedling will have the advantage of a mature root system and you won’t have to worry about your seedling potentially not being resistant to soil pests. Most fruit trees you buy are grafted for this reason. It will likely still take a few years though. If I grow a fruit tree from seed and it takes longer to fruit than you said can I complain to you? No! Grow the seedling under sub-optimal conditions and it will take many years longer to fruit. It is possible to grow a fruit tree and never have it flower if its growing needs are not met. It is also possible to have a mature fruiting tree stop producing fruit if the conditions are wrong. Growing in too much shade, too much competition from near by plants and/or soil not being fertile enough, not enough water, wrong temperatures (ie growing tropical trees in temperate areas), and restricting root growth by growing in too small a pot are common reasons for your fruit tree not fruiting. I am in no way responsible for this as I have no control over it. Where do I get fruit tree seeds? Chances are you don’t want to select parent varieties with desirable traits and cross pollinate them yourself – you could do this but it is a lot more effort and you need access to parent stock in flower. You could buy fruit tree seeds from various places online, but why would anyone bother unless it is a fruit that you can not buy from the shops? It is far more simple, and a lot cheaper, to buy fruit, eat it, and plant the seeds from there that you otherwise would have thrown away. The chances of growing something spectacular out of that is just as high (if not higher) than buying fruit tree seed from any nursery. What about polyembryony? I conveniently ignored the topic. I have not had enough experience dealing with this to be able to comment properly. It is common in citrus and mangoes but can be seen in other plants as well. It can make seed grown plants turn out much like the parent, some people say they are clones. If you are concerned then do some research. What about Genetically Modified (GM) varieties? In Australia you won't have access to these so there is no chance that they will contaminate your new strain. In other countries you may come across them, but it is pretty unlikely. Fascinating post. Thanks. I bought a property in the hills in 1981 where the previous owner had made apricot jam and tossed out the apricot pips. It wasn't long before I had fruiting apricots and they are delicious. I have a little forest of cherry trees there, due to the birds having pinched every single cherry every year, since 1981. Bought a few more trees in the last couple of years. The baby trees haven't made fruit yet, but I had one flower last year. In the city I have a one-year old 'volunteer' apricot, due to birds pinching most of my apricots each year. Sigh... I'm keen to see when my baby tree has fruit. I agree, it is heaps of fun growing fruit trees from seed. Far too often people are told never to try because it is too difficult, and it takes too long to fruit, and the fruit tastes dreadful, but that often isn't the case. I was given a small pomegranate tree a while ago that was flowering/fruiting. It has never flowered since, I assume the conditions are not right. I have started some pomegranate seeds (from a nice fruit I ate) and in a year they are already as tall as the small plant I have and the stems are almost as thick. I can't wait to see hoe long until they flower!